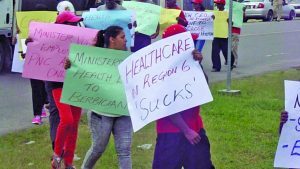 Residents of Region Six (East Berbice-Corentyne) on Monday staged a picketing exercise outside of the New Amsterdam Hospital following reports that the Chief Executive Officer (CEO) remains on the job even after the Regional Democratic Council (RDC) had announced that she would be removed. Following the picketing in front of the hospital, the group of protesters went to the Health Services Director’s office and continued their picketing exercise before returning to the hospital. 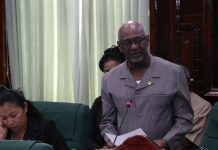 Kennedy, while at the Health Director’s office they chanted slogans suggesting that the Director of Health Services, Jevaughn Stephen has been covering up mismanagement. 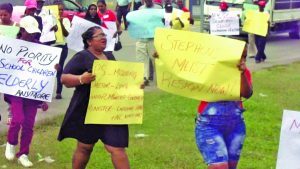 As the protestors made their way from the Health Director’s office, a group of A Partnership for National Unity (APNU) supporters met them in a counter-protest. Some of the APNU protestors attempted to pull away the placards from those who were against the CEO and Stephen’s alleged actions. 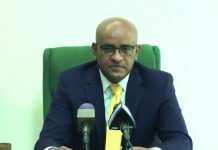 Meanwhile, Chairman of the Regional Health Committee, Zamal Hussain on Monday called on Stephen to apologise to the people of Berbice for being dishonest regarding the removal of Dr Samantha Kennedy as the CEO of the New Amsterdam Hospital. Hussain also warned that the region will not sit idly by and allow the New Amsterdam Hospital to be mismanaged. 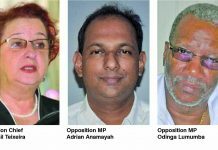 Last Thursday, Hussain had informed the RDC that Permanent Secretary (PS) in the Public Health Ministry Colette Adams informed the Health Committee that the hospital would be getting a new CEO. However, on Friday, Stephen told the media that the CEO was not fired. On Monday, Stephen met the protestors who were also calling for his removal. In response to the allegations that he misled the public, Stephen told the media that this was not the case. Hussain, who lead the picketing exercise, said the Director of Health Services, the Junior Health Minister and the PS are misleading the public since it was promised that the CEO would be replaced because of mismanagement and deficiencies in the health service in Berbice but this decision has been reversed. 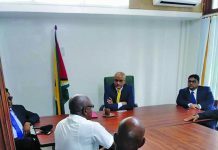 While both the Health Services Director and the Health Committee Chairman are of different views on the CEO’s removal, <<<Guyana Times>>> was able to obtain a recording of the meeting between the PS and Hussain. “We are also looking to have the CEO’s position looked at and have someone from the region fill that position. The CEO’s position was temporary,” the PS is heard saying in the recording. The issues at the New Amsterdam Hospital were highlighted some weeks ago when frustrated residents in the region took to the streets to protest, among other things, poor services at the facility, drug shortages, the death of a resident and the nonfunctioning mortuary.